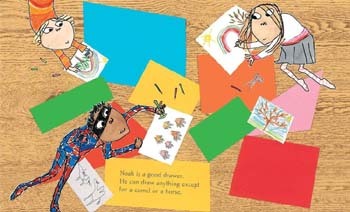 Lauren Child is considered one of the most talented and creative author/illustrators working today. Her first two books were published in 1999 – I Want a Pet and Clarice BeanThat’s Me, and she won the prestigious Kate Greenaway Medal in 2000 for I Will Not Ever Never Eat a Tomato, the first of her Charlie and Lola picture books. The Clarice Bean series has sold over 6 million copies worldwide. In October 2005, the BBC launched a 78-part animated series of Charlie and Lola. The series has won four BAFTAS and is aired in more than 34 countries. In 2008 Lauren Child launched UNESCO’s ‘My Life is a Story’ Campaign for UNESCO’s Programme for the Education of Children in Need, and was named a UNESCO Artist for Peace in 2008. In 2010 she was awarded an MBE for Services to Literature. Her most recent work is the Ruby Redfort detective series for Harper Collins. Book four in the series is called Ruby Redfort: Feel the Fear published in September 2014. 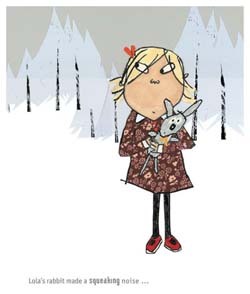 In autumn 2014 Puffin Books published The New Small Person, Lauren’s latest picture book. 2015 is the 15th Anniversary of the first Charlie and Lola picture book and the 10th Anniversary of the Charlie and Lola TV series.